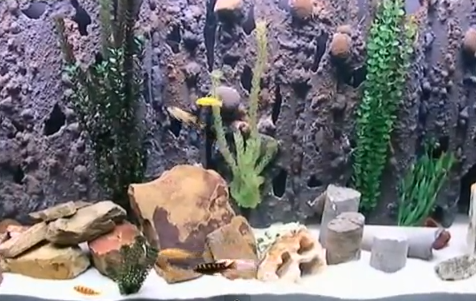 Use PVC to make an aquarium background that is also a cave for your fish! Cut pieces of PVC pipe to the height needed for your aquarium tank and draw cave holes onto the pipes. Cut out the cave holes and color the inside of the pipes around the cave holes to block out any visible white. Attach the pipes in a row with expanding foam and glue rocks to the pipes for weight and texture. Use fish-safe paint to color the cement mixture and coat the aquarium background with several layers of cement. Paint and decorate your homemade aquarium cave, and place the structure in your tank with a slight gap between the glass and cave for your fish to enjoy. I see that you have cichlids and sand rather than gravel in the aquarium. How do you keep the aquarium…especially the background…CLEAN?!? 1) Snails or other live tank cleaners could make quick work of keeping them clean. 2) You could cut off the back of the pipes, so they would sit flat against the wall (and cover the outside back of the tank with a piece of black paper); that way you could easily just move them away from the wall to expose the inside for cleaning. 3) Use the DIY Algae Cleaning Brush. As long as you have pipes that are wide enough for your arm to fit into and short enough for you to reach the bottom, this cleaning brush should help to remove algae. 4) You could scrape the insides with an algae scraper just like you would a wall of the tank, but use a slightly smaller size pipe as the scraper since they’re curved.